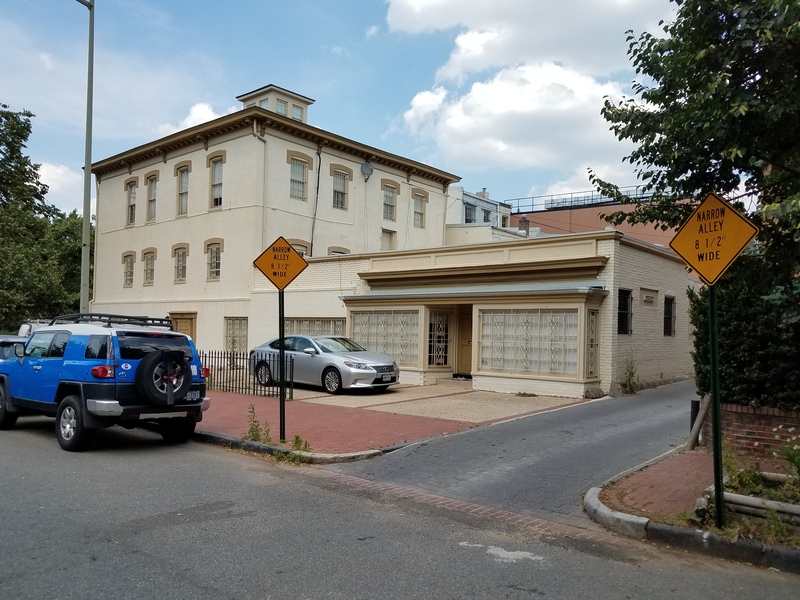 The Congressional Hispanic Caucus will not be housing its PAC office and event space out of 428 New Jersey Avenue, SE. The failure to get the zoning adjustment in order to operate in the residential neighborhood will apparently nix the $2 million sale. 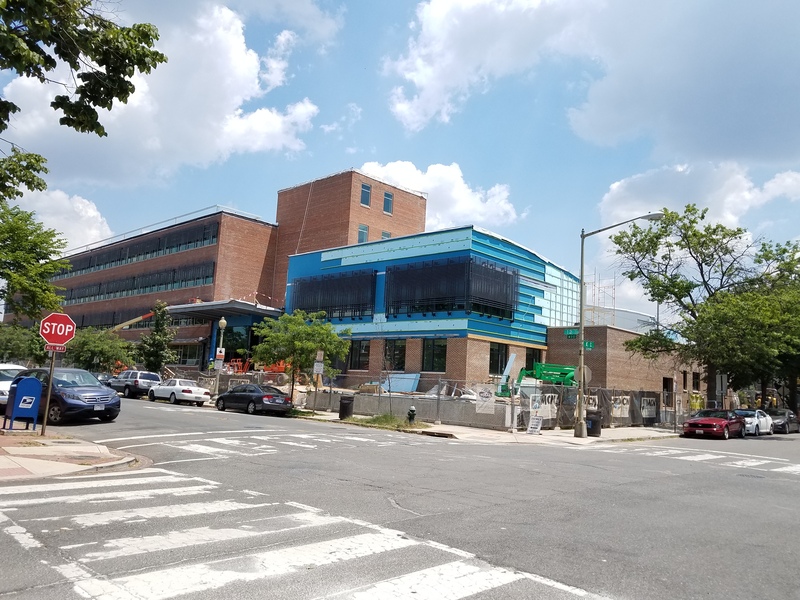 Today, the attorney for the Congressional Hispanic Caucus (CHC) formally withdrew the group’s application for a zoning adjustment to permit CHC to use a residence in the 400 block of New Jersey Avenue, SE, as their PAC headquarters and event space. The letter to the BZA withdrawing the application came from attorney Meridith Moldenhauer of Cozen O’Connor, and said in part, “On June 7, 2017, the [BZA] granted a continuance of the hearing to allow the Applicant additional time to further supplement the record. As a result of further deliberation, the Applicant withdraws the Application.” The sale of the townhouse to the CHC was apparently contingent on the zoning relief. 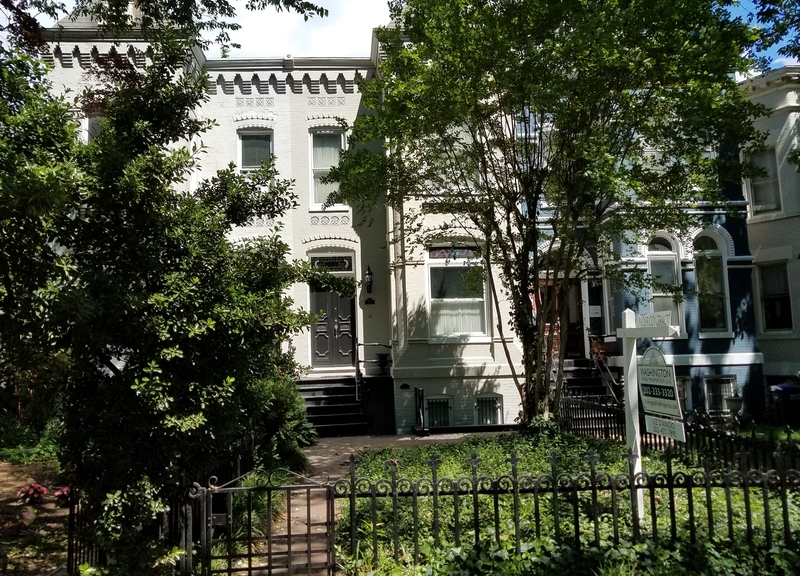 At issue was the application to waive DC regulations limiting nonprofit organizations operating in residential neighborhoods to buildings of 10,000 square feet or more. No reason was given for the action, but neighbors believe that opposition from more than a dozen residential neighbors (who had hired their own attorney), ANC6B, the Capitol Hill Restorations Society, the Office of Planning, and the Architect of the Capitol, left CHC with slim chance of prevailing before the BZA. The block is home to several organizations currently operating businesses in a residential zone. But the city is starting to take a hard look at the erosion of residential neighborhoods near the Capitol. ANC Commissioner Jennifer Samolyk, in whose single member district the property resides credited the activism of neighbors whose efforts had contributed to shutting three down non-residential “party” houses on nearby D Street, SE. In addition, as a result of a complaint which Samolyk filed with DCRA, the city has started an official investigation of another business that appears to be operating out of a New Jersey Avenue residence without a certificate of occupancy and in violation of the zoning regulations. The decision is likely to affect the desirability of other properties on the block in the eyes of non-profit or non-residential users. Currently there are two adjacent townhouses up for sale on the block, reportedly by a single owner. 433 New Jersey is listed at $1.4 million and its neighbor is listed at $1.77 million. The real estate listing notes: “Opportunity Abounds! Your chance of a lifetime to own not just one, but two adjacent houses on New Jersey Avenue. You could scarcely get closer to the US Capitol and House Office Buildings, the DNC and the RNC.” The properties have been on the market since last December. CHC reached out to Moldenhauer but has not yet received a response. CHC will update this post upon receipt. ANC6A Community Outreach Committee meeting. ANC6B Executive Committee meets at 7:00pm in Hill Center to set the agenda for the July meeting of the full ANC. Rosedale Community town Hall meeting on public safety, with CM Allen and MPD Chief Peter Newsham. Allen and Newsham will be joined by representatives of DC’s Office of the Attorney General to discuss public safety and what is being done to educate and protect DC residents. 6:30pm at Pilgrim AME Church, 17th and Rosedale Streets, N.E. PSA 106 meets at 7:00pm in the Community Center at Capitol Quarter, 1000 5th SE. Eastern Market Community Advisory Committee meets at 7:00pm, North Hall, Eastern Market. 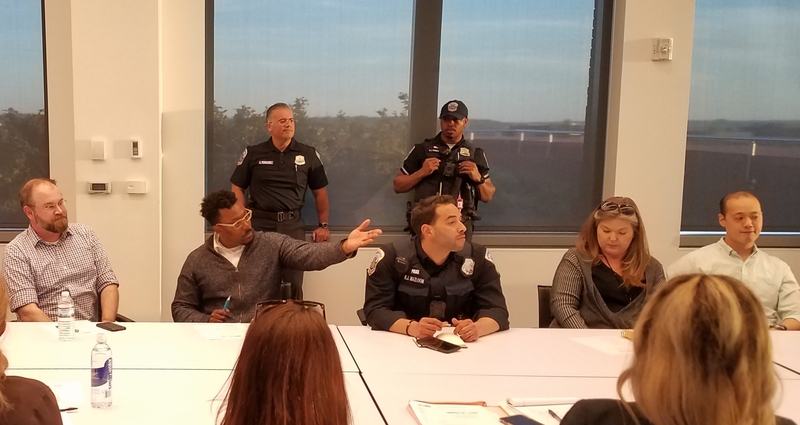 The Bureau of Zoning Adjustment meets to consider zoning adjustment applications, including that of the Congressional Hispanic Caucus’ request to for an adjustment to permit conversion of a residence on New Jersey Avenue, SE, into office and event space. 9:30am, Room 2205, One Judiciary Square, 441 4th Street, N.W. If it comes to fruition, the food and drink retail plan will bring with it several concerns for the community. 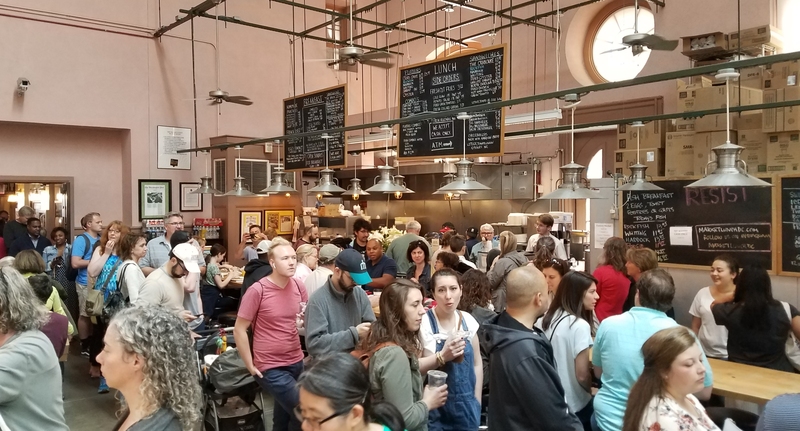 Among these is the seeming affirmation of the conventional wisdom that food and alcohol retail is becoming the only viable retail on Capitol Hill. 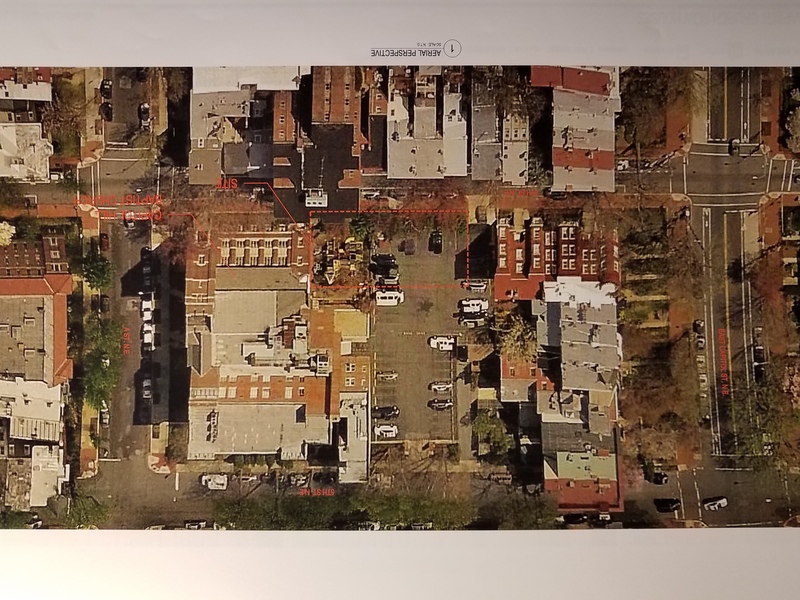 In addition, the issues associated with food and drink retail on Barracks Row – trash disposal, rodent, noise, and odor control – will need to be addressed through Settlement Agreements with ANC6B. There will likely be changes in traffic patterns and parking availability – as it is, the developer is providing 50 parking spaces for the 174 condo residents, anticipating that a majority of occupants will depend on public transportation. Will that be true for patrons of the Market? 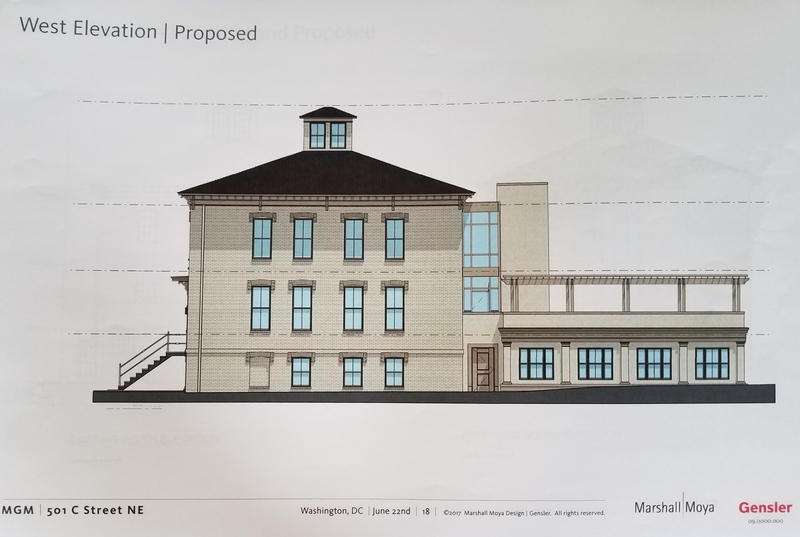 Opposition to the plan was led by ANC6C, represented by Mark Eckenwiler, who praised the restoration of the building as a “meritorious project” and said there was much to like in the proposal. However, he said, ANC6C could not support the proposed rear additions and the elevator shaft. He noted that although outside the scope of historic preservation, a serious issue for the ANC was the objections of neighbors who decried the potential for disruption and noise from events (fund raisers) on the 1600 square foot deck atop the one story additions at the rear of the building. 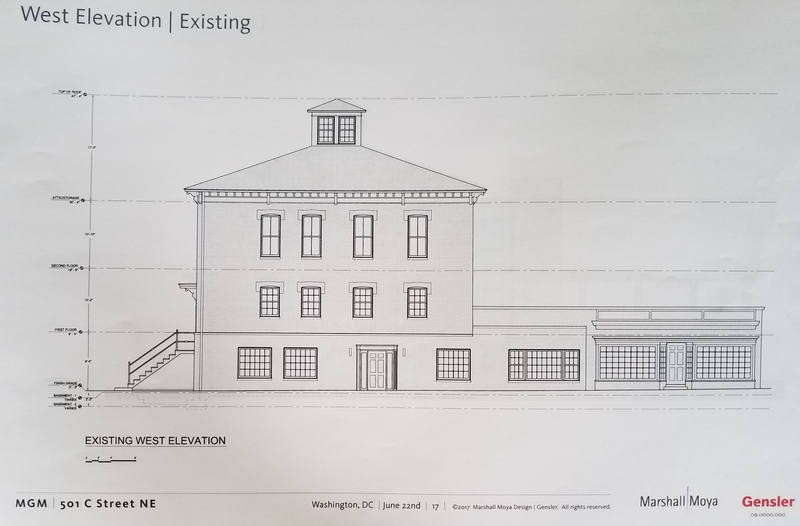 The Capitol Hill Restoration Society, represented by Beth Purcell, agreed that the design has many commendable features but raised concerns about the exterior elevator shaft, the roof top deck and the proposed pergola overlooking 5th Street. 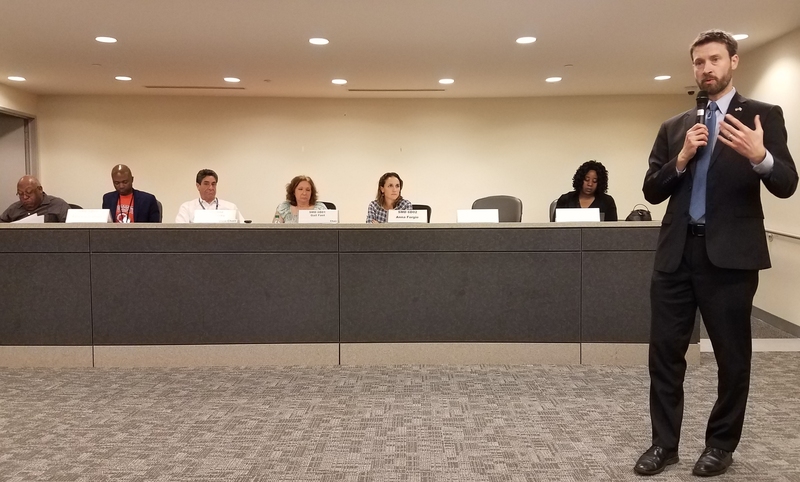 Regarding the associated issue of noise and disruption, she said “Lobbyists entertain – not to mention how the deck might be used by a future owner of the building.” Five nearby residents or building owners reinforced that concern with testimony before the Board. If anything, the HRPB was more critical than either the ANC or CHRS. After hearing from MGM reps respond to why the proposed design was necessary for the building to work for the owner, four of the board members spoke out against the exterior elevator and the deck. The consensus seemed to be that the elevator should be inside the building, the size of the deck should be reduced and confined to the east side of the roof of the additions, the pergola moved east to the edge of the reduced deck, and access to the west side of the addition’s roof overlooking 5th Street should be prevented by installation of a green roof or by enforceable easement. Chairperson Heath agreed, and moved that MGM work with HPO staff to address the Board’s concerns and come back next month where the issue will be placed on the consent calendar for action after the Board has an opportunity to review changes to the design. The motion passed unanimously. Haven’t seen the work on Watkins School recently? Here’s how it looked on June 13, 2017. ANC6A Transportation and Public Space Committee meets at 7:00pm, Capitol Hill Towers, 900 G Street, N.E. Presentation by DDOT officials of 90% plans for Maryland Avenue, N.E. redesign project and discussion regarding plans to redesign Florida Avenue, N.E. ANC6A Alcoholic Beverage Licensing Committee meets at 7:00pm, Sherwood Recreation Center, 10th and G Streets, N.E. Among items on the agenda. Capitol Hill Restoration Society Board of Directors meets at 6:30pm, Capitol Hill Townhomes, 750 6th Street, S.E. ANC6A Economic Development and Zoning Committee meets at 7:00pm, Sherwood Recreation Center, 10th and G Streets, N.E. Capitol Hill Restoration Society Members Meeting. Presentation: Ruth Trocelli, HPRB Archeologist will speak on “What Secrets Lie Beneath the Shotgun House”. Trocelli and her team will present the results of their excavation of the Shotgun House site. A display of found artifacts will accompany the excavation. 7:00pm at the Hill Center. Free and open to the public. The Historic Preservation Review Board meets to consider various historic preservation cases. 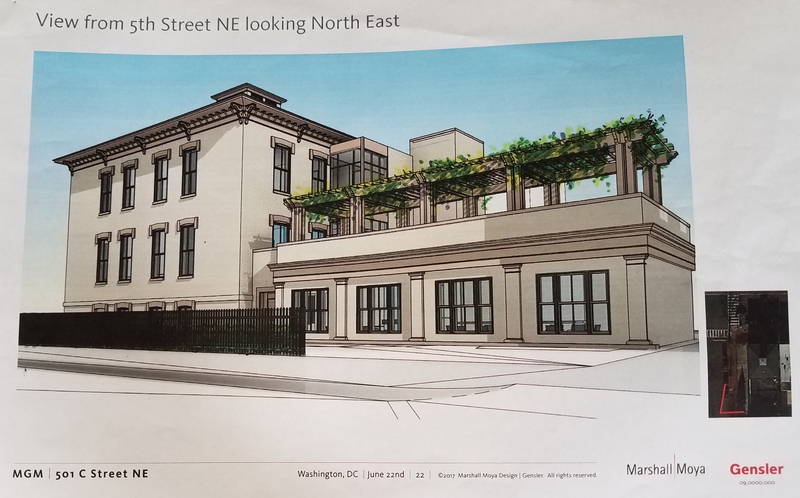 At circa 11:15am, the Board will consider the concept for the Capitol Hill’s Baptist Church proposal for five townhouses on church property, at 525 A Street, S.E. At circa 1:00pm the Board will consider the MGM Corporation concept and proposed rear additions to the building at 501 C Street, N.E. The Board meets at 441 4th Street, N.W., Room 220 – south. Although several church members were present to endorse the project, a number of nearby residents voiced their concerns or opposition. Many of these concerns had to do with the impact of the new residences on parking, not only from residents of the townhouses, but also from parishioners attending Sunday services. One resident questioned the commitment of the church to be part of the neighborhood, alleging that his efforts to engage the church had been rebuffed. Another said that she had been surprised and disappointed to find that five townhouses meant ten units, and another complained that her bedroom windows face the project and rooftop decks on two of the units affect her quality of life. Associate Pastor Jamie Dunlop told the ANC the new housing will replace rental housing which the church already has in the neighborhood for pastor trainees. Renters will be families, some long term, some shorter – for 4 or 5 months. He said that construction will result in the loss of 8 parking spaces on site, and a total of 14 on Sunday. The church is attempting to secure commercial parking for those parishioners who drive, but half of the congregation lives within walking distance of the church. The Historic Preservation Application will come before the Historic Preservation Review Board on June 22. MGM plans a lobby shop for this building at 501 C Street NE, facing Stanton Park. Across the street to the right is Peabody School. Here’s the current West Elevation of the structure. The contentious issues are visible from the proposed changes, viewed below. West Elevation with proposed changes. This shows the size of the proposed party deck. 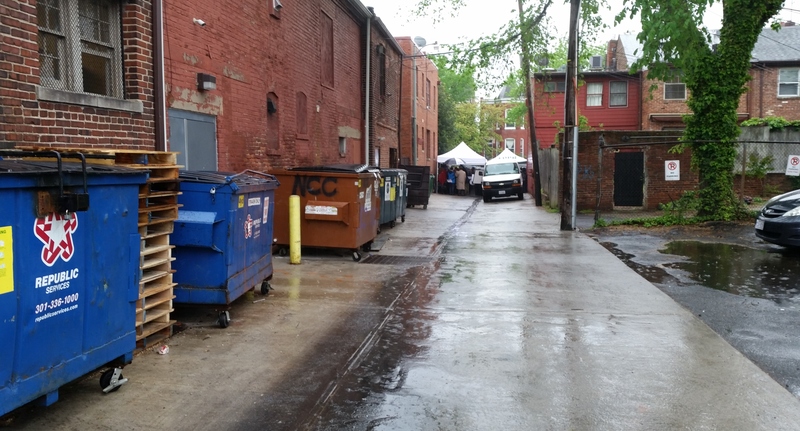 ANC6C and CHRS say the side yard – which is actually public space – will be used for parking. This is the view of the proposed modifications from 5th Street, looking northeast. The erosion of Capitol Hill residential neighborhoods takes place in large ways – like the use of townhouses on New Jersey Avenue by lobbyists and non-profits for offices, and small – like the incompatible additions to and uses of commercial buildings that have a negative effect on residents. A case in point concerns the deep-pocketed MGM Corporation which is in the business of films and gambling (National Harbor casinos), which plans to open up a lobby shop at 501 C Street, NE, on the south side of Stanton Park. The 500 block is zoned C-2a for office use and all the buildings on C Street are used for that purpose. The currently slightly shabby, but still grand 1876 building on the northwest corner of the block was built as the home of former U.S. Treasury official, Silas C. Clarke. The large Italianate style building is in the Capitol Hill Historic District and requires approval from the city to alter the property – the owner submits a Historic Preservation Application (HPA) to the Historic Preservation Office (HPO) requesting approval to make changes to the property. The HPO makes a recommendation to the Historic Preservation Review Board. MGM plans to restore and renovate the former residence in ways that should delight neighbors as well as those concerned with historic preservation. But what MGM gives with one hand, it takes away with the other. The design includes elements that raise the hackles of nearby residents as well as the Capitol Hill Restoration Society and a majority of ANC6C’s Planning and Zoning Committee. These elements include an exterior elevator tower with glass sided bridges between the tower and the building’s upper floors, an expansive roof top party deck with a pergola behind the building, and parking on public space. Most of the other businesses on the block have private parking space, and none has a roof deck. MGM hired the respected architectural historian Anne H. Adams of the powerhouse real estate law firm Goulston & Storrs and prominent historical preservation architect Michael Marshall of Marshall Moya Design to shepherd the project through the city bureaucracy. Adams submitted Historic Preservation Application on behalf of MGM. The Capitol Hill Restoration Society (CHRS) met with Adams and Marshall on June 5. 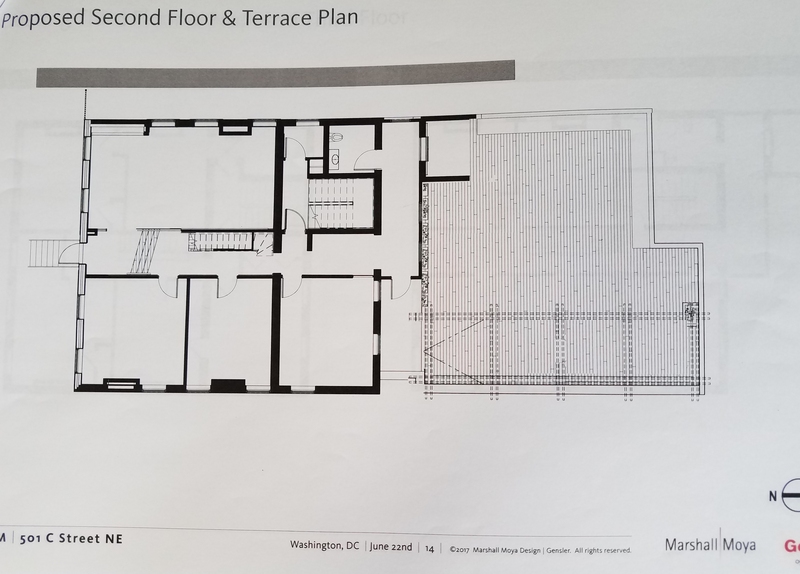 CHRS found that the elevator addition, the roof top deck, and the pergola rendered the project incompatible with the Capitol Hill Historic District. The Society also noted concerns regarding “the potential noise and function of the roof deck as well as the continued use of the side yard for parking,” (neither directly related to historic preservation though some preservationists are making a case that use of public space is a historic preservation factor) as well as lack of letters of support from nearby residents. It would surprise if such letters are forthcoming, given the impact on the neighborhood of parking for MGM staff and those attending events at the building. 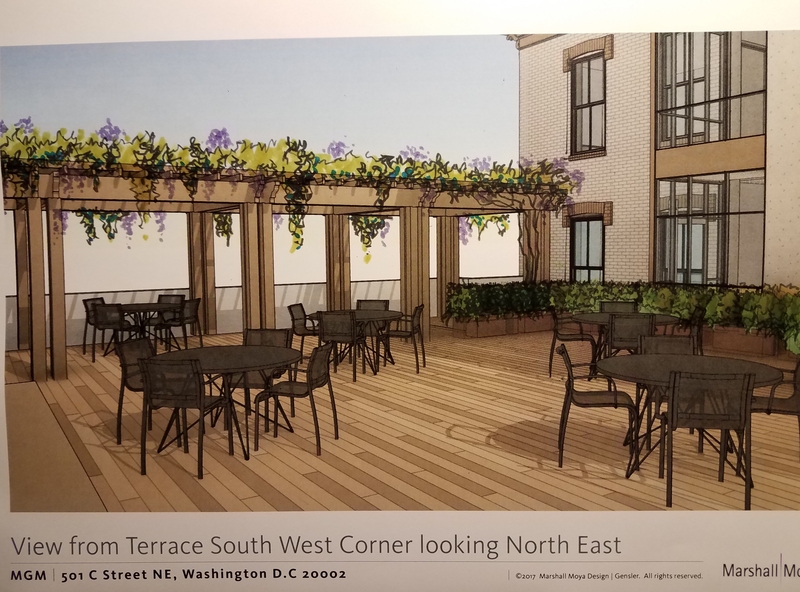 On Thursday night, the ANC6C’s Planning and Zoning Committee voted 4 – 3 to oppose a motion to support the Historic Preservation Application, without revisions to address the issues of the elevator tower, the party deck, and side yard parking in public space. 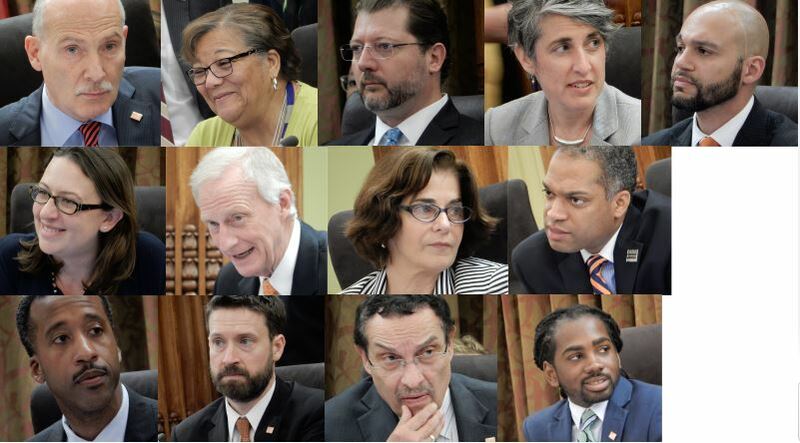 The full ANC6C will consider the HPA at its meeting at 7:00pm, Wednesday, June 14, at the Heritage Foundation, 214 Massachusetts Avenue, NE. MGM representatives had until the close of business today, June 12, to submit modifications of the plan. The Historic Preservation Review Board Hearing on the matter is scheduled for Thursday, June 22, 2017. The ANC is an advisory body, whose opinion is, by city regulation, given “great weight” by city agencies. Many in the community who have been involved in trying to preserve the residential character of the Capitol Hill community feel that the MGM proposal crosses a line. 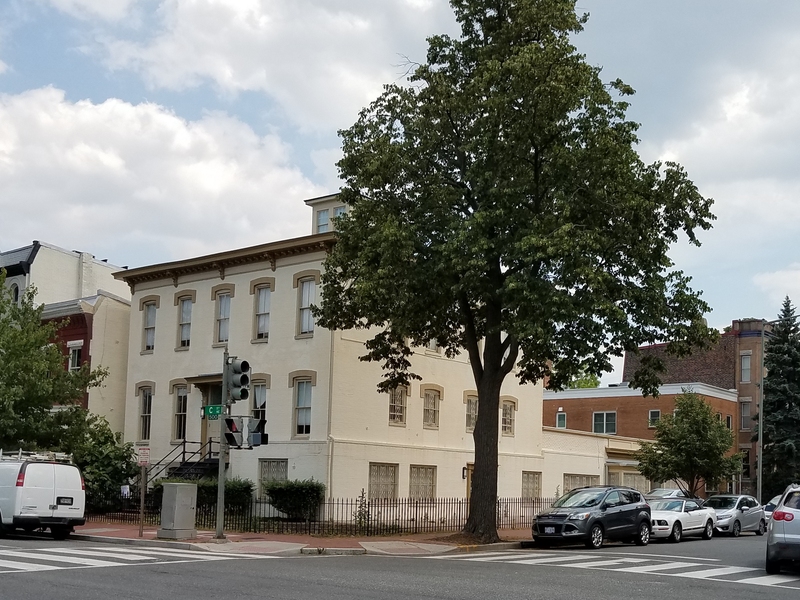 Much will depend on residents’ attendance at public meetings where this is being considered – the ANC6C meeting on Wednesday, and the Historic Preservation Review Board hearing on June 22. DDOT’s Project Manager for Streetcar Planning Jamie Hensen (left) briefs ANC6A on plans to extend the H Street Streetcar lines east and west. The DC City Council is scheduled vote on the proposed FY 18 budget on tomorrow. 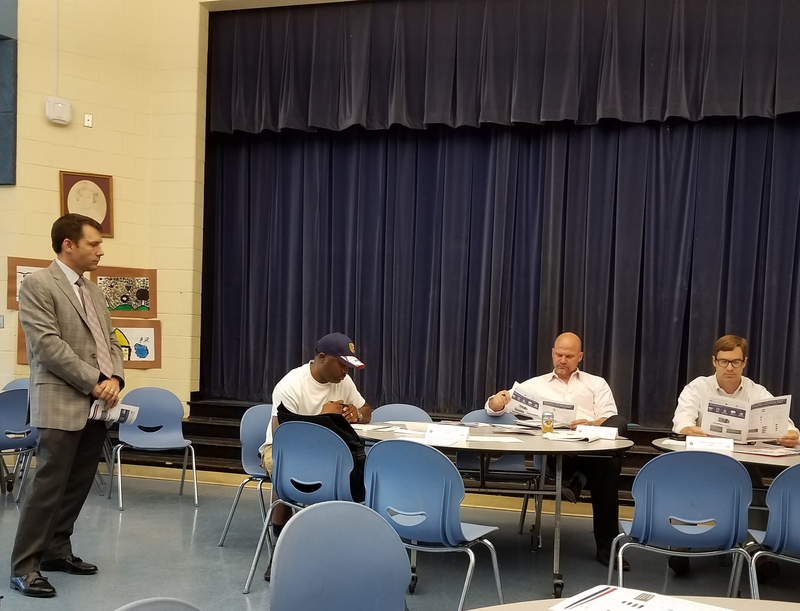 Last Thursday night, DDOT’s Project Manager for Street Car Planning Jamie Hensen, gave ANC6A an update on the extension of the Streetcar Project. Hensen recounted the previously widely reported bad news for the project regarding the reduction in FY 18 funding for the proposed extensions of the H Street line east to the Benning Road Metro Station and west to Georgetown. Last month, the City Council released a proposed budget which reduced the Mayor’s request for $160 million over six years for the extension eastward, to $100 million and put off additional funding until FY 2023. The $100 million allocated by the Council will allow planning to continue but under the best scenario, construction could not begin until 2023, instead of 2020. The Council increased the Mayor’s request for funding the Georgetown extension from $165 to $196, but delayed spending the funds until 2020-2022. 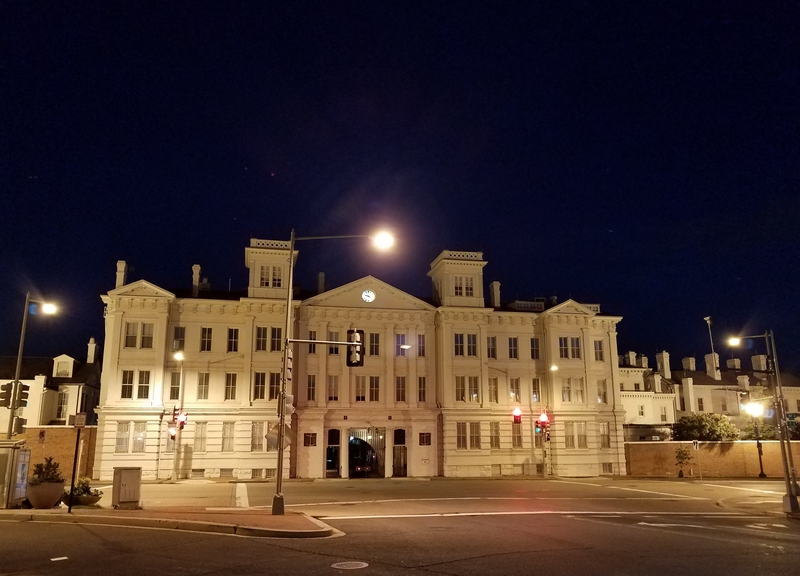 ANC6B reacted in a proposed letter letter to the Mayor and City Council, saying that the funding was “unceremoniously stripped from the budget the council was presented to enact late the night before the Council vote.” On May 30, the Council took the first of two required votes on the FY 18 budget. Tomorrow, Tuesday, June 13, the Council will take the second required budget vote. Jensen also briefed the Commission on the recently completed ridership and travel time analysis, saying that the H Street Streetcar currently attracts 3000 riders a day, seven days a week. DDOT estimates riderships on an extension from Union Station to Georgetown will attract 5700 riders per mile, making it, one of the higher ridership streetcar lines in the US. The Environmental Assessment (EA) for both extensions is currently underway, city agency and public meetings on the assessment will occur in the Fall of 2017, followed by a public meeting on, and publication of, the Environment Assessment in the winter of 2017/2018. Final approval of the National Environmental Policy Assessment is expected in 2018. 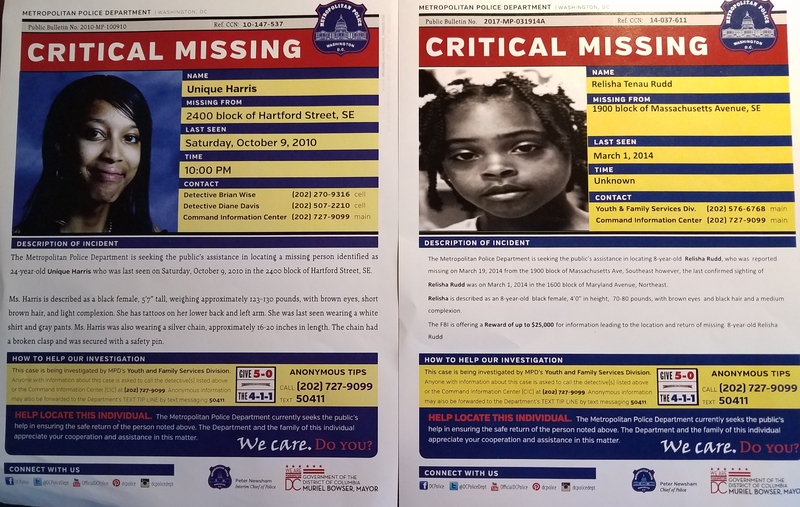 Last Sunday, more than 8 years after her daughter’s disappearance, Unique Harris’ mother was distributing these two flyers in Lincoln Park. AN6D meets at 7:00pm, 1100 4th Street, SW, 2nd Floor. Florentijin, 11 Pearl Street, SW: new restaurant liquor license with entertainment and summer garden endorsements. Del Mar, 791 Wharf Street, SW: new restaurant liquor license with two summer garden endorsements. Union Stage, 740 Water Street: new tavern liquor license with entertainment and license to serve liquor on a boat. Hyatt House, 725 Wharf Street, SW: new hotel liquor license with two summer gardens with entertainment endorsement. Canopy by Hilton, 975 7th Street, SW: new hotel liquor license with entertainment endorsement and summer garden with entertainment endorsement. Hank’s on the Wharf, 701 Wharf Street, SW: new restaurant liquor license and with summer garden endorsement. Dacha, 79 Potomac Avenue, SE: new tavern liquor license with summer garden and sidewalk café endorsements. Presentation: Director Fred Mossally, from the DC Alcohol Beverage Regulation Administration. Hawk N’ Dove, 329 Pennsylvania Ave., SE, Renewal of a Tavern liquor license with a sidewalk café, with Cover Charge Dancing Entertainment Endorsement. Lola’s, 711 8th Street, SE, Renewal of Tavern liquor license with a sidewalk café endorsement. The Ugly Mug, 723 8th Street, SE, Application to add a Brew Pub Amendment to the existing license for the establishment. Install equipment on street level floor of the premises to produce 275 barrels or 525 half-kegs of beer. 1108 South Carolina Avenue, SE: Historic Preservation Application: Concept/two-story rear and side additions. 1108 South Carolina Avenue, SE – Zoning Adjustment Application for a special exception from the lot occupancy requirements to construct a two-story rear and side addition to an existing one-family dwelling in the RF-1 Zone at 1108 South Carolina Avenue, SE. Alley Lot at 2015 3rd Street, SE: Zoning Adjustment Application for special exceptions from the rear yard requirements and the side yard requirements, and for variances from the alley centerline setback requirements and the pervious surface requirements to construct a two-story, two-unit apartment house on an alley lot in the RF-3 Zone at 205 3rd Street SE. 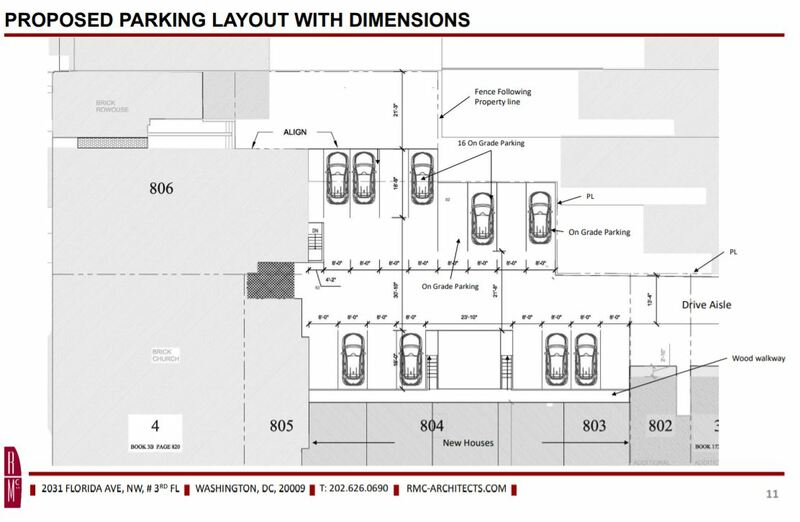 Report on modification of concept of the Safeway site, 415 14th Street, SE. Large Track Review (LTR) No. 2017-03. Report on DDOT Presentation on 15th/Kentucky/Potomac/G Street Intersection Study. Police Service Area (PSA) 104 public meets at 8:00pm, Stuart Hobson Middle School, 410 E Street, NE. ANC6C meets at 7:00pm at Heritage Foundation, 214 Massachusetts Avenue, NE. Presentation: Council Member Robert White. Report one 3rd and L Street, NE, mural project. Report on NoMa underpass projects. 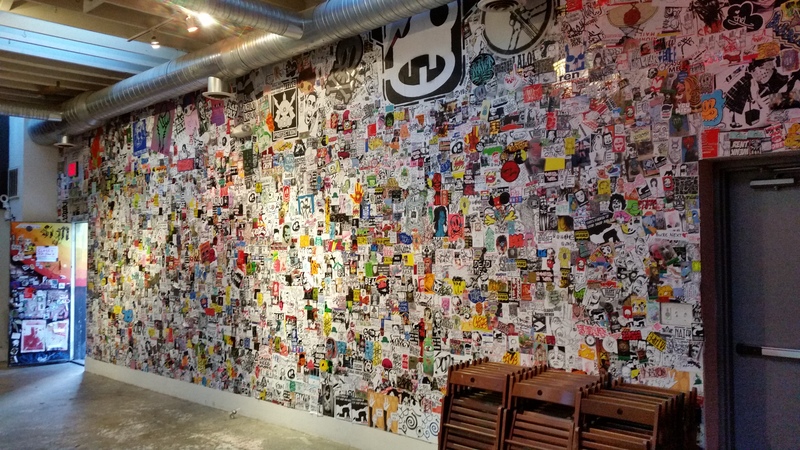 Buredo, 625 H Street NE, new restaurant liquor license application. Farmbird, 625 H Street NE, new restaurant liquor license application. Fare Well, 406 H Street NE, entertainment endorsement and summer garden applications. 501 C Street NE, Historic Preservation Application, concept approval, rear addition and façade alteration. 525 A Street NE, Historic Preservation Application by Capitol Hill Baptist Church, concept approval, five new town houses along 6th Street. 1005 1st Street NE, Zoning Adjustment Application, mixed-use project with hotel, residential and retail uses. Follow-up letter to the Council on the February DCRA issues roundtable. PSA 108 meets at 7:00pm, Liberty Baptist Church, 527 Kentucky Avenue, SE. 2. CHRS Zoning Committee meets at 7:30pm, Kirby House, 420 10th Street, SE.